Hi, Actually I'm quite new to this Escribe thingy and been using VT133 since early last year without any changes on the factory set up since then. Have updated the pack (SP5) yesterday and load the baby with new materials (SS316 without the L, Ti,etc....). Bought SS Stagger Fused Clapton SS316L (26ga+32ga)*2 + 32ga by Geekvape recently and currently been sucking on Pharaoh RDA by DigiFlavor. Thought of exploring the custom setup for the coil but it seems I'm going nowhere. 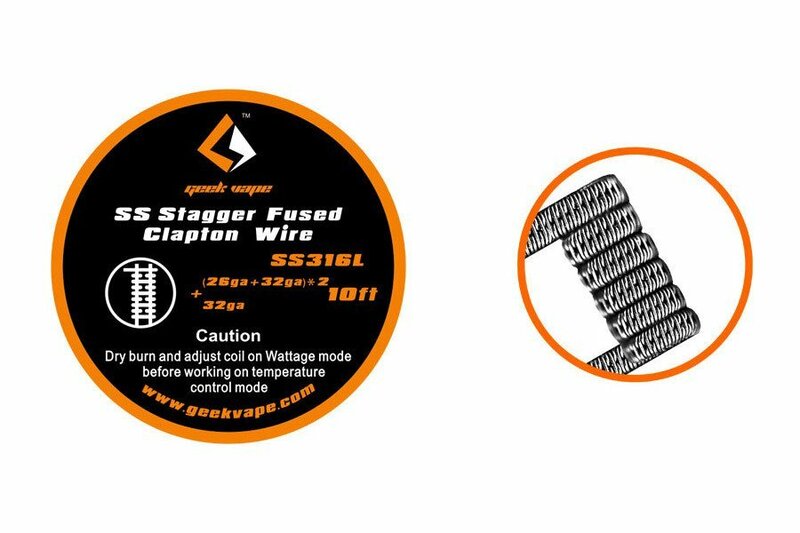 You should use a spaced coil if you're using SS316L. Claptons don't work in TC mode. Micro coils also don't work well in TC mode. Personally, I have used both SS316L and SS304 and I find the latter works much better due to a steeper TCR function. I've tried both 28g with 7 wraps and 27g with 5 wraps and the 5 wraps works better for me (about a 0.5 ohm resistance with a single coil) - on the 28g coils it heats less evenly and the centre of the coil gets much hotter than the 5 wrap coil. I've used 2.5mm and 3mm coils and prefer the results I get from a 3mm coil. Daniel from DJLSBvapes did some testing on (I think it was older firmware) and found that using a TCR value gave slightly more accurate performance temperature wise than the steam engine CSV, although I don't know if this is still the case after newer firmware releases. I use the CSVs with no problem and don't notice much of a difference between the CSV and TCR. SS316L alloys vary significantly. I have bought some wire labelled as SS316L that is unusable and others that vape perfectly. If you're having problems and using spaced coils then maybe the wire isn't good. With SS316L you need to be very sure you have a stable resistance due to the very low TCR. Even a 0.01 ohm delta makes about a 10 degree celsius difference in temperature setting. So in a nutshell, the temperature is really just a "guide" - don't rely on it being perfectly accurate. I couldn't disagree more strongly with the spaced coils. Burning them and packing them until all hot spots are eliminated allows me to maintain a resistance on a coil for MONTHS. Even after burning and scrubbing them, and wicking them countless times. Spaced coils are just annoying to deal with in general. I built a DNA 250 box mod last night, loaded the CSV from steam engine, but as mentioned, Daniel from DJLSBvapes mentioned the TCR setting (.00092) was more accurate. I don't know if that holds true any more. But it worked with the stuff I was using on a different device. TCR on the DNA 250 was better than my previous mod. So perhaps I'm not seeing an issue across a broad spectrum because it's still new to me. But if it can light and TC a .08 dual wire / dual coil set up, basically on start up. I have no fear it's fine with just about anything I throw at it with just touching up the temperature here and there. I was within 15* of where I was on my other mod on the DNA and it was a better smoother vape and TC. I avoid burning my SS coils because of the possible risk of release of hexavalent chromium, although to be fair this risk is relatively low because of the high temperatures required for oxidation of hexavalent chromium (someone did some lab tests a few years back and didn't find any after dry burning SS coils). It takes me 5 minutes to make and fit a new coil (about as much time as it takes to to burn one clean and rinse it), so I prefer to err on the side of caution. I also find if I burn a (spaced) coil that the metal becomes tarnished and the coils gunk up much easier. I don't do nickel, and I don't like Ti either. But my fear of SS is 0%. I prefer scrubbing them with a tooth brush and whatever's left of a single drop of dried dawn dishwashing liquid, then doing some quick burn/rinse cycles. I also build for 2 people across a lot of devices and atty's. If I had to build coils every 2-4 days when I rewick and clean things I would shoot myself in the face. I also hate spaced coils because they are inconsistent (resistance) and I prefer to remember the approx resistance of every atty I touch because if it reads differently - then something is not right. It's not just my face on the other end of it, but someone I care about. They are also fiddly when you are trying to bang the crud off and get some new wicks in, say as you are about to walk out the door and it gets handed to you with the "hey before we go..." Utility is key, and I have found no performance benefit in spacing them. Simply annoyance. So in the end, I still disagree with you completely. But we do both agree on proper atomizer / coil maintenance being paramount. So cheers to that! I prefer scrubbing them with a tooth brush and whatever's left of a single drop of dried dawn dishwashing liquid, then doing some quick burn/rinse cycles. I also build for 2 people across a lot of devices and atty's. If I had to build coils every 2-4 days when I rewick and clean things I would shoot myself in the face. I also hate spaced coils because they are inconsistent (resistance) and I prefer to remember the approx resistance of every atty I touch because if it reads differently - then something is not right. I also use a toothbrush and dishwash liquid to clean coils. It works a charm. However, my spaced coils are totally consistent in terms of resistance. Every time I wrap a coil I get almost exactly the same resistance, down to the 0.01 ohm level, so for me at least, a spaced coil is far from inconsistent. I think the risk of Cr+6 is low, but it's there and still not conclusively demonstrated that it's non-existent, so personally it is something I prefer to avoid because I can. Anyway, to the OP, despite many people preferring spaced coils for SS TC, there's at least one person here who has experience to the contrary and feels that a non spaced coil is better. It's not an exact a science, so try both methods and see which one works best for you. I'm not dogmatic about it - whatever gives you the best experience and is most convenient. I use contact coils for SS316L and its been great. There are pictures of the builds and screenshots of device monitor while firing. I am using a single coil Stainless Steel 26g/36g Alien in the Goon @ 490 degrees it works perfect,cant ask for a better vape .i bought my coils online from a good builder very pleased with the results . i thought that a single wire coil would work better than a clapton style but i was wrong. Claptons don't work in TC mode. But, why not? Been using ss316L Clapton coils, spaced, and TC works very well. SS Claptons work fine in temp control. I use regular, fused, and triple core and they all work great. Never had a problem.